The 500,000+ acres of the Pisgah National Forest surrounding Asheville feature some of the most beautiful and rugged mountain scenery, and the best recreational opportunities in eastern North America. The Pisgah National Forest covers much of the north and central western mountains of North Carolina - with whitewater rivers, waterfalls and hundreds of miles of trails. It was established on October 7, 1916 with the first tract of land purchased under the Weeks Act, which led to the creation of the national forests in the eastern United States. It is also home of the first school of forestry in the United States, now preserved at the Cradle of Forestry in America Historic Site, and boasts two of the first designated wilderness areas in the east. All of this land was originally part of the Biltmore Estate! As part of its national Treasured Landscapes, Unforgettable Experiences conservation program, the National Forest Foundation (NFF) designated the Pisgah National Forest as a Treasured Landscape in 2017. The Pisgah Ranger District is dominated by Mt. Pisgah on the Blue Ridge Parkway and extends on both sides of the Parkway. It is located roughly between the towns of Brevard, Waynesville and Asheville. This area is especially noted for easy access to many beautiful waterfalls, including Sliding Rock, as well as wonderful hiking and camping opportunities, the Cradle of Forestry and more. Mountain bike at Bent Creek. 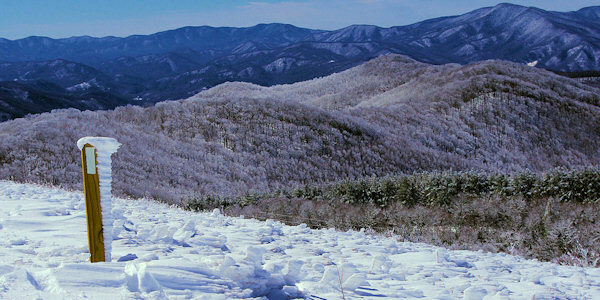 The district also includes the Shining Rock and Middle Prong Wilderness areas. Drive the Forest Heritage Scenic Byway. See hikes for Looking Glass Rock, John Rock, Black Balsam Knob, Sam Knob, Graveyard Fields, Skinny Dips Falls, Daniel Ridge Falls, Log Hollow Falls, Cove Creek Falls, Twin Falls, Slick Rock Falls, Pink Beds Hike, Mt. Pisgah, Courthouse Falls, Wildcat Falls, Devil's Courthouse, Turtleback Falls and the NC Arboretum. It's home at the impressive Pisgah Astronomical Research Institute (PARI). 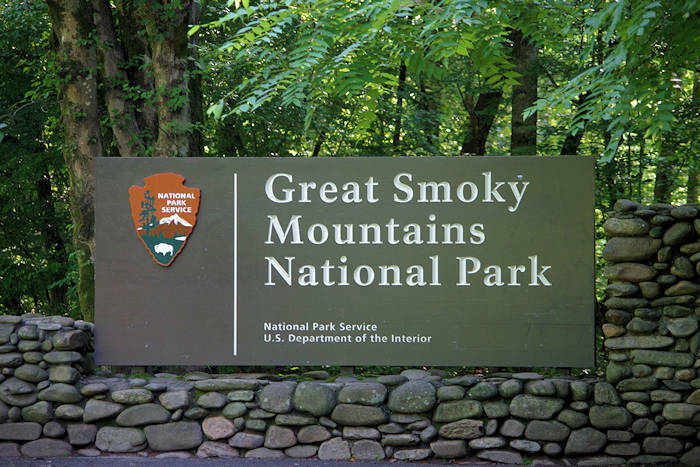 The Appalachian Ranger District covers a large area along the North Carolina/Tennessee border, northeast of the Great Smoky Mountains National Park. Among the highlights of this region are the Harmon Den mecca for horseback riders, Max Patch mountain (pic) offering stunning panoramic views, the French Broad River, Lover's Leap and the Appalachian Trail. 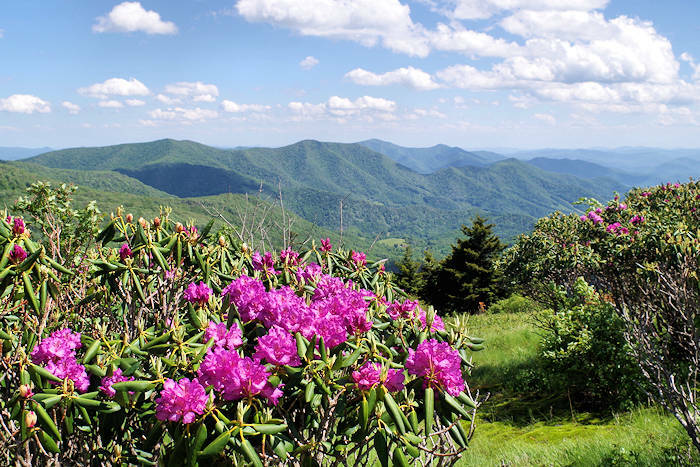 This area contains some of the most beautiful mountain scenery in the east including important wildflower habitats at Craggy Gardens and Roan Mountain. Also included in this district are Mt. Mitchell and Grandfather Mountain. Waterfalls include Douglas Falls and Walker Falls. 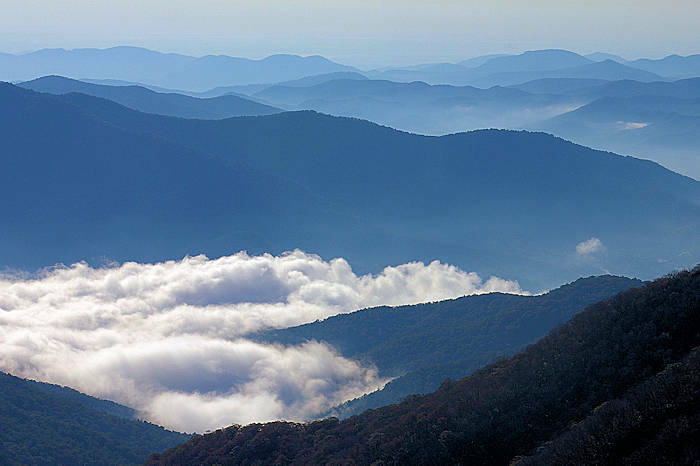 The Grandfather Ranger District lies southeast of the Blue Ridge Parkway, from north of Asheville to Blowing Rock. 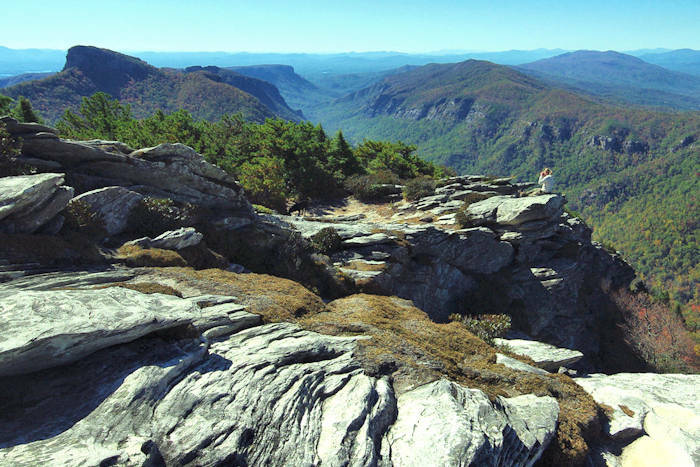 Linville Gorge (pic) is the predominant feature of the area, with its very rugged terrain to challenge even experienced hikers. There are also easier trails in this area. Other significant features include the Wilson Creek area, which is highly favored among kayakers, and the Brown Mountain Off-Road Vehicle area. The Point Lookout Trail opened in 2008 for bikers. Nearby is Catawba Falls. 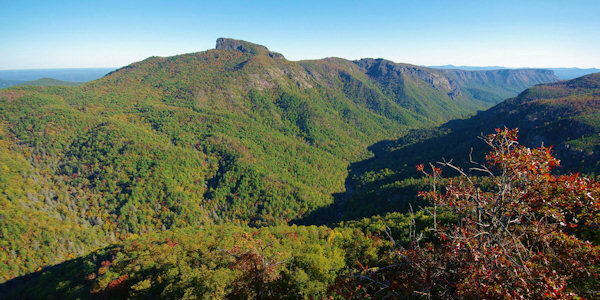 Great trails near Linville Falls include Beacon Heights, Rough Ridge and Chestoa View. Also see Roaring Fork Falls, Setrock Creek Falls, Tom's Creek Falls and Upper Creek Falls. 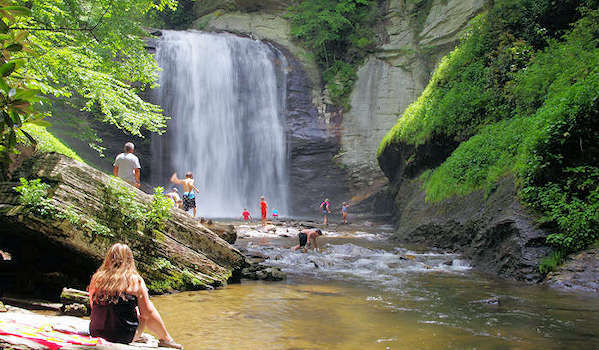 Explore the natural and cultural wonders of Pisgah National Forest through guided hikes and small tours for waterfalls, stargazing, sunsets and more in the Brevard area, presented by the nonprofit Cradle of Forestry in America Interpretive Association. Custom private tours also. Take a full-service, guided fly fishing or bass fishing trip near Asheville. You can enjoy the Appalachian Mountains by boating and/or wading in North Carolina's stream-fed lakes and rivers. Professional fishing guides ensure exciting fishing on the best pristine rivers in WNC. 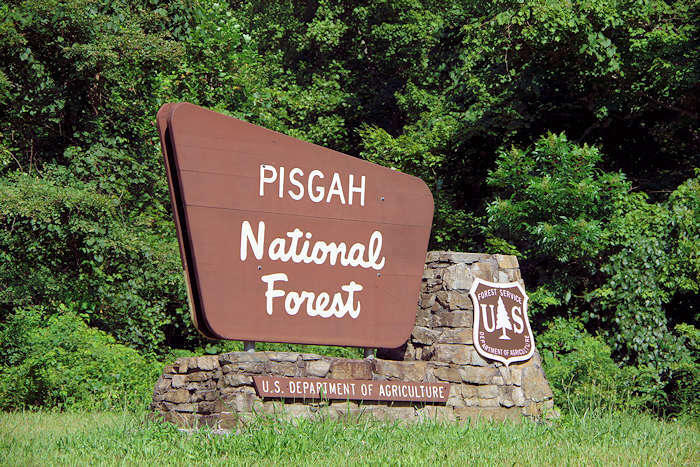 Join the fun and help with work projects in Pisgah National Forest in the Looking Glass area - including trail maintenance, repairs, plantings and more (sign up in advance), coordinated by The Pisgah Conservancy. More than 80 traditional craftsmen, exhibitors and entertainers celebrate our forests at the site of the first forestry school in America. Wood carvers, weavers, blacksmith, archery, horse-drawn wagon rides and lumberjack competition at the adjacent Pink Beds picnic area. The Pisgah National Forest offers full-featured campgrounds like Lake Powhatan as well as primitive and group campgrounds. See our Camping Guide and our Bear Safety Tips. If you are backpacking, check with the ranger office in the area you want to explore since regulations vary by region. Take a guided trip at Pisgah Stables or find a trail to bring your horse (see our Horseback Riding Guide). Want to camp? Wolf Ford Horse Camp is located off Yellow Gap Road about three miles northeast of the Cradle of Forestry in America Visitor Center. This 14-site camp provides access to many miles of equestrian trails in the South Mills River area. Wash Creek Horse Camp is a group reservation site located five miles northeast of North Mills River Recreation area. It offers access to equestrian trails in the North Mills River, Trace Ridge and Wash Creek areas. For information about reservations, call Pisgah District at 828-877-3265. Dogs are allowed on a leash on all trails. Also see Pet-Friendly Asheville. See our Waterfall & Hiking Safety Tips before you hit the trail. The beginnings of the Pisgah National Forest occurred when George Vanderbilt assembled property around his growing Biltmore Estate that grew to 125,000 acres. Much of his "Pisgah Forest" was managed for the production of timber, water and other natural resources. This 86,000-acre area was sold after Vanderbilt's death in 1914 to the U.S. Government and became one of the first tracts of the Pisgah National Forest. The selling price of $433,500 was well below its value ($5/acre).